Lamb chops braised with maple syrup and apples take advantage of fall flavors. Photography courtesy of Meat And Livestock Australia. A delicious way to cook lamb chops, this recipe uses apple juice, maple syrup, green apple and prunes. This is Page 3 of a four-page article. Click the black links below to view the other pages. Prep time is 10 minutes with a cook time of 1 hour. Serves 4. Trim the chops of external fat and season to taste. Heat the oil in large, heavy-based pan and sauté the chops on a high heat for 2 minutes each side or until browned. Combine the apple juice, stock, maple syrup and lemon juice, and add to the pan. Reduce heat, cover and simmer over a low heat for 30 to 40 minutes or until lamb is very tender. Remove lamb from pan, cover with foil and keep warm. Boil the remaining juices until thick and syrupy. Return the lamb for a few minutes to heat through and coat well with the sauce. 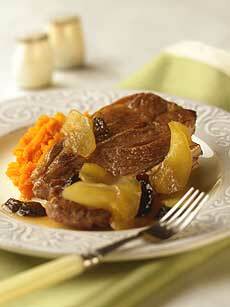 Serve the lamb chops on mashed potatoes or squash, and spoon on the sauce, apples and prunes. Recipe© copyright Meat And Livestock Australia. Additional material Lifestyle Direct, Inc. All rights reserved. Photos are copyright of their respective owners.